As everyone has heard by now, Robin Williams passed away yesterday at the age of 63. Even typing the words I have trouble accepting and believing them. For people of my generation, who grew up just as Williams was making a name for himself, he's always been there and one started to assume he always would be, serving as a constant source of frenetic comedy and warmth through his stand-up, his acting, and the manner in which he conducted his life. I still have fond childhood memories of the whole family gathered around the TV to watch Mork & Mindy, where we were first introduced to his unique brand of humor as he fired off jokes and slapstick gags (many of them improvised) to play a child-like alien attempting to acclimate to the strange ways of Earth. The program epitomized Williams' great talent at fusing outrageous and sometimes raw comedy with a layer of kindness and amiability. Watching his comedy specials, you were overwhelmed by his exuberant, rapid-fire presence that kept jokes coming at such speeds you often hadn't finished laughing at one before another hit, a trait that sometimes made it difficult for co-stars to keep a straight face. A great example of his talent for improv is a sketch from a comedy special from the 80s featuring Williams and Burnett as mourners at a funeral. After performing it as written, Williams got sudden inspiration and asked to take another shot at it, as seen below (sadly the video ends just before Burnett really starts to lose it). You can imagine that if he had given it a dozen different attempts, each one would be unique and brilliant. 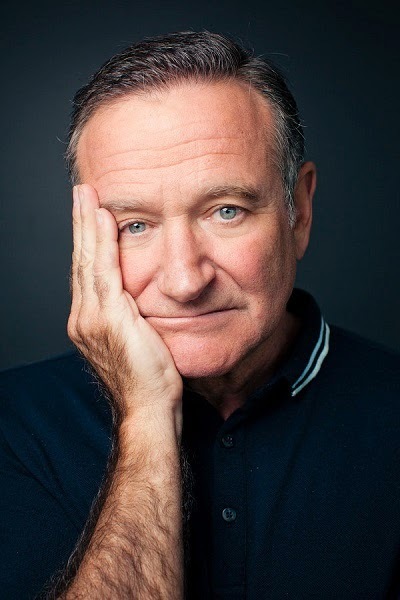 Along with his trademark wit, Williams was renown for his kindness and generosity, as demonstrated by the huge number of friends he had among his peers and fellow actors to his varied charity work, particularly his annual appearances as co-host of HBO's Comic Relief telethon to help raise money for the homeless. Perhaps the most telling instance of how Williams used his comedic abilities to help others involves his friend and former Julliard classmate Christopher Reeve, who struggled to cope following the accident that left him paralyzed and even contemplated suicide. How does one comfort someone trapped in such a horrific situation? For Williams, the only solution was to burst into Reeve's hospital room impersonating a bumbling Russian doctor and announce he was there to perform a proctological exam. Reeve couldn't help but laugh and in doing so realized that if laughter was possible, so was living. And it's this mix of gentle compassion and comic energy that has defined so much of Williams' film work. Is there anyone else who could have captured the mumbling demeanor and pugnacious decency of everyone's favorite cartoon sailor in Robert Altman's surreal adaptation of Popeye? Or how about freewheeling Armed Forces Radio DJ Adrian Cronauer in Good Morning Vietnam, a role that showcased Williams' rapid-fire wisecracks while also hinting at the dramatic actor Williams would prove himself to be. In Terry Gilliam's The Fisher King, he created a bittersweet portrait of divine madness as Parry, a homeless man who has retreated into fanciful delusion to escape personal trauma. Even in such crowd-pleasing movies as Mrs. Doubtfire, Williams always found a layer of truth beneath the sitcom-humor surface, turning a comedy about a crossdressing dad into a portrait of how families weather the trauma of divorce. As he became a superstar, Williams was always conscious of contributing to a project without overwhelming it. For his bit part as a former therapist open to the possibilities of the supernatural in Kenneth Branagh's Dead Again, he urged Branagh not to feature him in the advertising so as not to confuse audiences into thinking it was a comedy. He went under a pseudonym for his cameo as the disembodied King of the Moon in Gilliam's wild fantasy The Adventures of Baron Munchausen and agreed to be paid scale for his vocal work as the pop culture-obsessed genie in Disney's Aladdin. Even with his success in comedy, Williams continued to challenge himself by transitioning into dramatic roles. My favorite performance of his, as Malcolm Sayer in Penny Marshall's Awakenings, finds Williams totally abandoning his madcap persona to play an introverted but compassionate physician who advocates for seemingly vegetative patients everyone else assumes are beyond help, eventually discovering an experimental drug that allows them to escape their catatonia. His efforts to help them and his observations of how they embrace life help him seize control of his own. Of course, Williams' best known and most celebrated dramatic role was as Sean Maguire, the worldly therapist to a brilliant but angry genius in Gus Van Sant's Good Will Hunting. Williams quite deservedly won an Oscar for the role, inhabiting the kind of sage mentor and confidant everyone wishes they had. His penchant for improvisation came in handy again. The scene below, where Sean describes some of his late wife's more embarrassing habits, was created on the spot by Williams and you can see the camera wobble slightly during it; the cameraman was laughing to hard, he couldn't keep the shot stable. Later in his career, Williams surprised everyone again with several villainous roles that had everyone's favorite funnyman playing chilling psychopaths. First, in Chris Nolan's third feature, Insomnia, Williams plays crime novelist and suspect Walter Finch, who injects himself into beleaguered homicide detective Al Pacino's investigation of a young woman's murder and seems to think he's living out one of his stories, callously applying the tropes of his fiction to the brutal realities of the crime. More sympathetic but even more frightening was Williams' performance as Sy Parrish, a methodical photo lab technician who becomes obsessed with his customers in Mark Romanek's One Hour Photo. Williams makes Parrish's torturous loneliness palpable, daring us to empathize with him even as he goes to violent extremes to manipulate his way into the lives of people to whom he barely registers. Williams would show this dramatic ability back on television as well. He portrayed yet another frightening antagonist as an anarchistic criminal mastermind who inspires a cult following on Law & Order SVU and gave a heartbreaking performance as a husband and father coping with the shooting of his wife in one of the strongest episodes of Homicide: Life on the Street. "There's a lot to be said for making people laugh. Did you know that that's all some people have? It isn't much, but it's better than nothing in this cockeyed caravan." When it was Robin Williams making you laugh, it was more than enough.